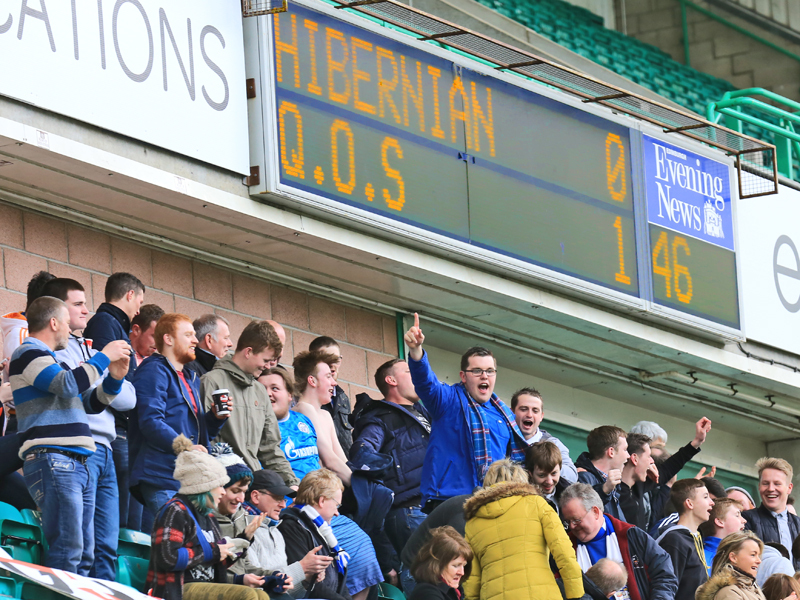 A Mark Durnan strike early in the second half was enough for Queens to leave Easter Road with the valuable 3 points and boosted the Doonhamers Play-off hopes. This was the Doonhamers third straight away fixture, suffering two losses in succession. Alan Stubbs`s Hibernian were also looking for their first win in two after also losing two games on the bounce. Queens made one change following the 2-0 defeat last week in the capital. Ian McShane replaced Mark Millar in the centre of the Queens` midfield. This was the first game since James Fowler had signed a contract extension keeping him at Palmerston for another season and hoped his side could round off the week with a win at Easter Road. The Last time the two sides met at Easter Road it ended a dull goalless draw and this game looked to be heading the same way as the first half followed in the same fashion. 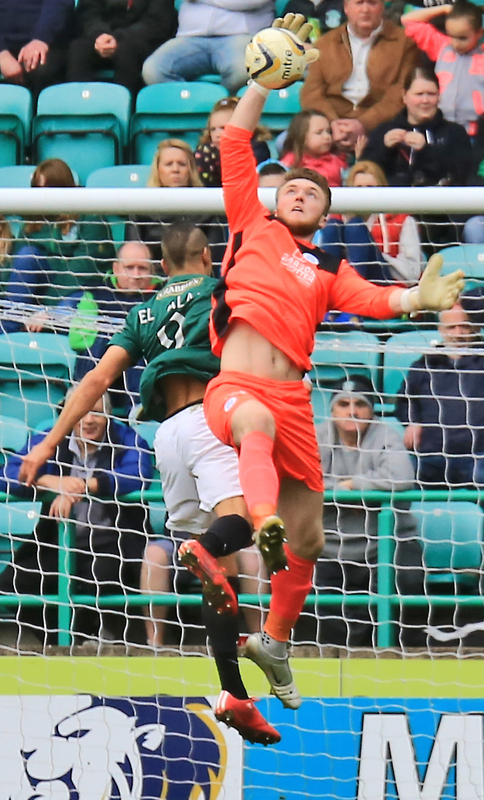 Queens started the brightest of the teams as Gavin Reilly and Kevin Holt nearly put the Doonhamers ahead in the opening minutes of the game but both players` shots trickled wide and didn`t trouble Hibernian `keeper Mark Oxley. Moments later, Fowlers men should have taken the lead when Reilly was put through and was denied by Oxley but from the rebound Derek Lyle chipped the keeper allowing Paul Hanlon to clear his shot off the line. Queens kept the ball well, frustrating the Easter Road faithful with some fine exchanges between Ian McShane, Stephen McKenna and Derek Lyle. After a slow start, the hosts began to look more confident but couldn`t break down the well organised Queens defence. Hibs right back Keith Watson managed to get in behind Kevin Holt but his dangerous cross just fell behind the oncoming Dominique Malonga. The hosts kept putting the pressure on the Queens defence. A superb Lewis Stevenson cross found Malonga but his header was blocked by Chris Higgins and fell into Zander Clarks arms. Hibs were beginning to take control of the game and threaten. 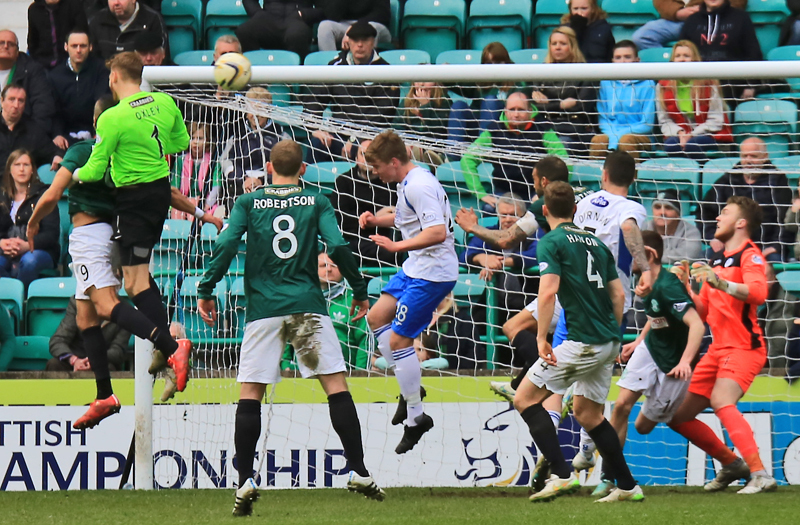 Scott Allan`s tried his luck with a long range shot but was comfortably saved by Zander Clark. But on the stroke of half time, Queens could have taken the lead when Daniel Carmichael`s cross found Lyle in the box and hit a spectacular half-volley but was denied by the full-stretched Oxley. The second half burst into life from the get-go. The Doonhamers again started brightly after the interval but this time their early pressure were rewarded in the 47th minute. Mark Durnan fired home, his 3rd goal of the season, from six yards out after some magnificent build up play from Carmichael. The match needed a goal, and it looked to have woken up the Hibernian players as they immediately tried to grab a leveller. But the equaliser wouldn`t come from the league`s top goal scorer Jason Cummings. The hitman was substituted on the hour mark for Farid El Alagui. It was El Alaguri`s introduction that spurred Hibernian into life, a long ball from the Hibs defence was nearly met by the Morocorran but Clark managed to claim the ball. Queens` were quite happy to soak up the pressure, with some fine defending from Andy Dowie, Chris Higgins and Mark Durnan. 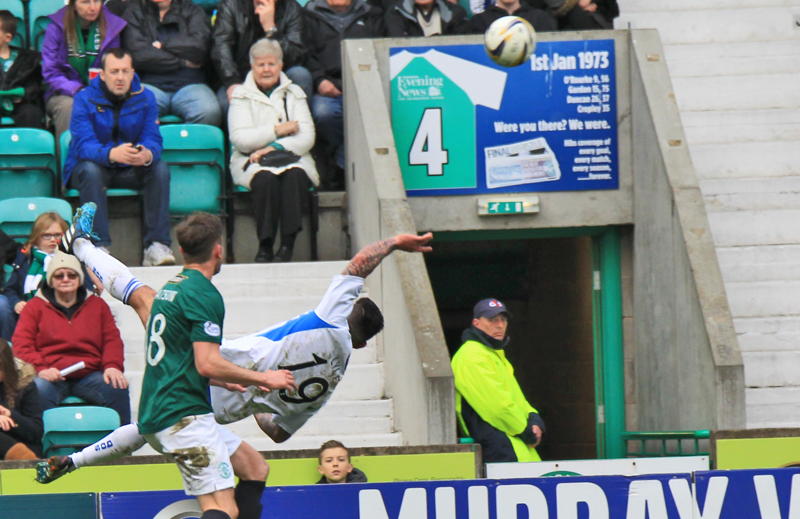 With ten minutes remaining, Malonga nearly levelled the match. The Congolese strikers looping header looked destined for the back of the net but Clark managed to punch the ball away. Hibs were looking dangerous and flirted with an equaliser when Sam Stanton managed to skip by the Queens defence but his shot was high and wide. Deep into time added on Hibs pressure was almost rewarded when the Hibernian `keeper Oxley went forward for a corner kick and managed to flick on to Malonga but once again the Chris Higgins superbly blocked his close range effort from the goal-line. Queens held on for the vital victory and manager James Fowler has had the perfect week, agreeing a new contract and three points at a tough venue. The Doonhamers are in home action on Thursday night as they welcome Rangers to Palmerston where they will be hoping to keep the pressure on Play-off rivals Falkirk. 14:04 Yellow Card : Good afternoon from Easter Road, team news to follow for today`s match against Hibernian. 14:05 Good afternoon from Easter Road, team news to follow for today`s match against Hibernian. 14:28 Queens make one change from the defeat against Hearts last week. Ian McShane starts replacing Mark Millar. 7 min First real chance of the game goes to Queens but Holt couldn`t hit the target. 12 min McKenna booked early on for a pulling on Stantons shirt. 13 min Derek Lyle nearly gives Queens the lead. Reilly`s shot was saved by Oxley and Lyle`s chipped rebound is cleared off the line. 34 min 30 minutes in and still goalless at Easter Road. Hibernian starting to take control of the game. 45+1 min Michael Paton hobbles off and is replaced by Lewis Kidd. Still 0-0 here at Easter Road. 48 min Sorry 1-0 Queens not 2-0. 78 min Malonga comes close as his looping header is punched off the line by Clark. Still 1-0 Queens.